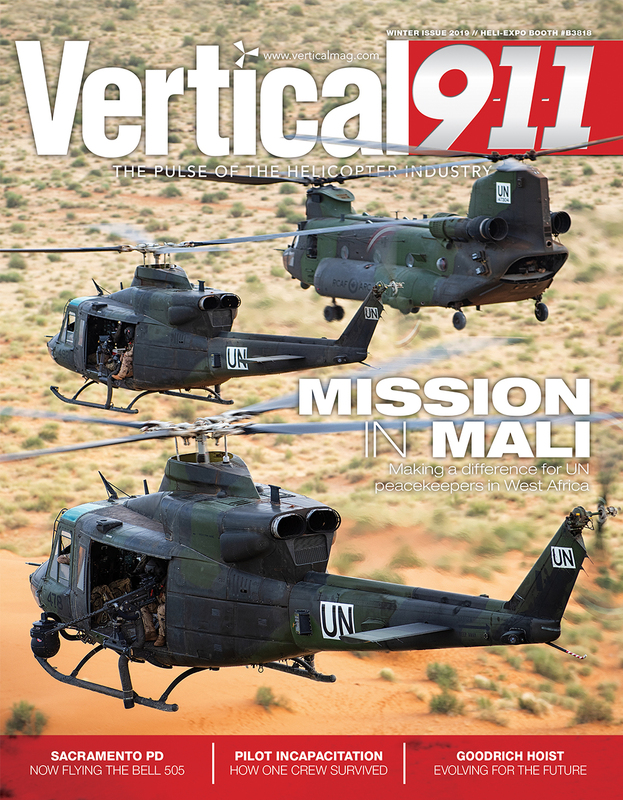 Anyone who has shot images from a helicopter knows what a challenge it can be. Even as a professional photographer, I had no idea what this entailed until I actually had to do it. With the doors removed, you have to combat the rotor wash, cold air, vibration levels and difficulty of communicating over the noise — all while fighting the restriction of the safety harness. It’s a real test of ability, equipment and perseverance. Shooting still images is hard enough; shooting vibration-free video with smooth pans and zooms is even harder. Of course, it’s all worth it because it allows you to capture unique and spectacular images. 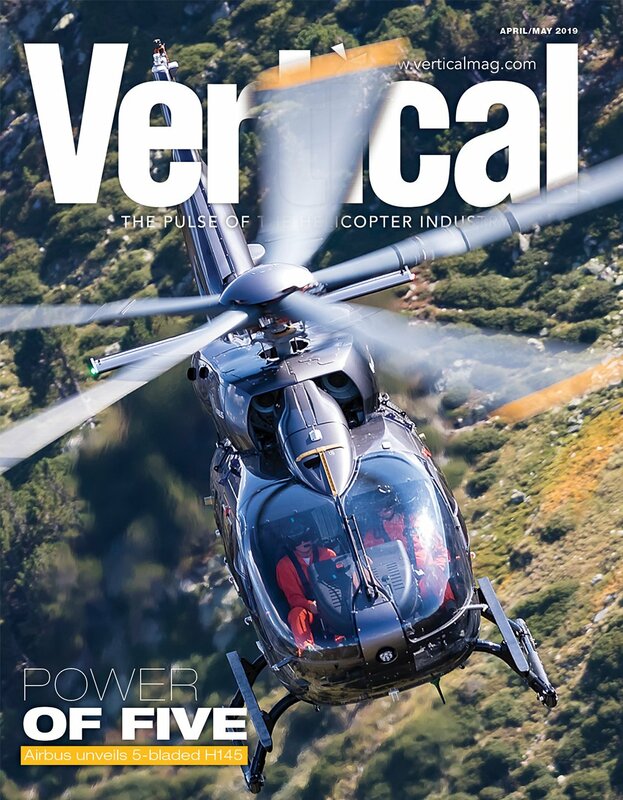 Who hasn’t seen the aerial shots in films and TV shows such as Skyfall, Hawaii Five-0, The Lord of the Rings — and of course this magazine — and been blown away by the grandeur, beauty and action they portray? 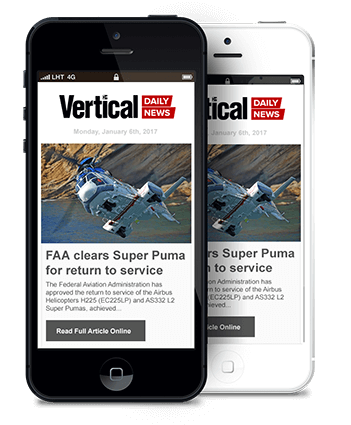 Aerial video in particular has seen something akin to a revolution in recent years, with the advent of digital image capture and HDTV. Fresh development in theater technologies has driven further growth in high resolution, demanding ever higher image quality from cinematographers. 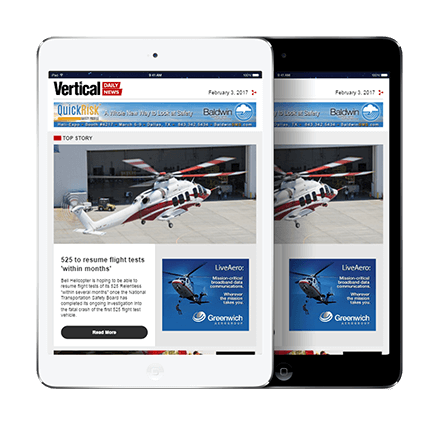 Ron Chapple, owner and aerial director of photography for Aerial Filmworks, has experienced this development first hand, having travelled the world collecting aerial video for clients producing television shows, commercials and Hollywood movies. “The limitations of existing aerial camera systems were holding back our ability to support Hollywood with very high resolution imagery [more than 1.5 times higher resolution than HDTV] in an economical and timely fashion,” he said. According to Chapple, these limitations relate not only to camera capture, but also to shipping, support, mounting, rigging and the availability of specially trained pilots and production crew. It was people like Ron and Curt Morgan — the president and CEO, respectively, of Brain Farm Digital Cinema (see p.96, Vertical, Feb-March 2012) — who convinced General Dynamics Global Imaging Technologies (makers of the Cineflex family of camera systems) that there was a need and a market for a high-end, versatile, professional-resolution digital production camera. Led by Robert McGill, VP and GM of General Dynamics Global Imaging Technologies, the conceptual needs for the system were defined. It was decided that the aerial camera package should incorporate design features that ensure easy shipping and simple rigging, accommodate a wide variety of mobile platforms, be easy to operate without much training, and utilize camera and lens components that meet or exceed Hollywood standards for resolution, color and image quality. The development process began over three years ago, when the company asked Hollywood production aerial directors and camera operators about what the ideal Super 35 format camera system would look like. The responses indicated a need for a pure digital camera with no electrical noise, that it should be light, have power conditioning, operate within nominal aircraft power specifications, and have easy mounting. It also should require no special wiring, have a wide range of lens magnifications, an intuitive operator interface and system flexibility — all while providing true cinematic-quality images. From this, a white paper was created, and the Cineflex engineers began to evaluate and assemble the Elite, a stabilized Super 35 format camera system. As in all Cineflex camera systems, gimbal stabilization was going to be critical in the success of the Elite. 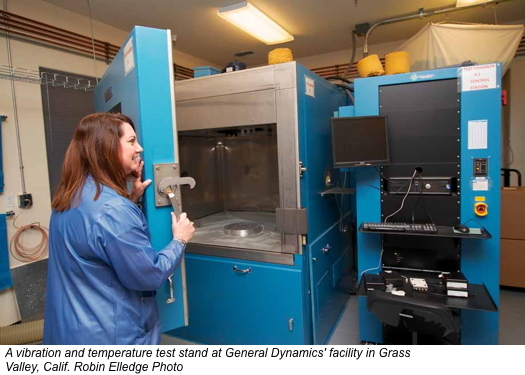 General Dynamics engineers began with their proven five-axis gimbal stabilization system, the heart of the new Elite. Fortunately, the gimbals manufactured for the Electronic News Gathering and HD systems provided a proven component, and one that only required minor modifications to the stabilization motors. But a major issue in creating a new camera and lens set is balancing the configuration to keep the center of weight even — front to back, and side to side — to allow proper articulation of the stabilization gimbals. This was accomplished with new mounting brackets and counter weights, and the system was then tested in a vibration stand for durability. Another critical step in the design process was finding a camera and lens that would produce the image quality needed for Hollywood films. Recognizing that the expertise of Cineflex engineers was stabilization — and not camera and lens development — the company sought partners to co-develop the new imaging system, finally choosing ARRI and Canon. ARRI, located in Munich, Germany, has a long history of producing professional motion picture equipment and has been recognized with 18 Oscar statuettes for innovation and technology. With worldwide support and cutting edge technology, ARRI could supply the support needed for the undertaking. ARRI had also recently introduced the very compact Alexa M modular camera. Essentially, ARRI broke a professional digital video camera into two parts: the head and the body, and connected the two with a high speed fiber optic cable immune to electrical noise and interference. Using the same turret housing as other Cineflex cameras, engineers modified it to accept the Alexa M digital camera head, which was specifically designed with aerial cinematography in mind. Its small size (just 8”x6”x5”) allowed the head to be coupled to a PL-mount Canon zoom lens while still fitting in the existing Cineflex housing. While other cameras were considered, the company said none of the other offerings had the combination of small size, camera shooting modes, flexible lens mount, and Hollywood acceptance as the Alexa M.
The other half of the camera, the body, resides in a Cineflex control box, or AuxBox, which is the largest single component of the system. It can be permanently or temporarily placed in the passenger compartment of an aircraft (the Elite can be mounted to a wide variety of platforms including fixed-wing aircraft, cars, and boats) using a rack; or, in our case, bungee-corded to a passenger seat. The Alexa M body houses much of the image processing and memory for recording video in a variety of frame rates and image formats, including 16:9 professional resolution. The remainder of the control box provides power to the camera system and the vibration control gimbals, while attaching to the operator’s laptop control unit with three wires. While the camera required no modifications to allow for remote control, the newly-introduced Canon Premier EF cinema lenses required custom-built servo-driven mechanicals to allow the lenses to be zoomed and focused remotely. This took some time, as it not only required the design of servo motors and small gear assemblies, but also nylon gears to be fitted to the lens barrels for focus and zoom control, and an entirely new operator control system. One of the unique challenges in aerial photography is keeping the focus and zoom stable while an aircraft is exerting a variety of forces. Once the initial design was completed, a prototype was developed for testing and evaluation. This process subjected the prototype to vibration, shock, hot and cold tests, 500,000 articulations of the gimbals, and a final field test. For filmmakers and camera operators familiar with the existing Cineflex stabilized camera systems, the Elite will look like an old friend. From the outside, the camera mounts in the same nose position as the other Cineflex cameras without special rigging or mounts. Inside, the laptop control system allows the operator to direct all the camera functions with minimal effort. A computerized operator interface panel allows access to camera setup and functions, while a number of switches and knobs control the housing and lens. An LCD flat panel video display with viewing hood is used for real-time and playback of video, without requiring the operator to hunch over for comfortable viewing. Once set for recording, the vast majority of control is via a joystick in the right hand and a knob with the left. With just two minutes of instruction, I was able to competently pan and zoom the camera system while in forward flight. The most difficult articulation is required in banking turns while zooming; a feat that requires a little more practice. From my perspective, the most difficult part of camera operation was avoiding motion sickness while peering into the hooded LCD screen. The five-axis camera stabilization system worked flawlessly during my flight without a hint of vibration. Adjustment controls for stabilization are also placed on the laptop control panel; but, for the most part, the stabilization works automatically. The operator must only manipulate the camera, lens, and housing. On my test flight with production unit number one, I had Jared Slater from Brain Farm Digital Cinema on board. While Slater had experience with the lower definition Cineflex units, this was his first exposure to the new system. In 20 minutes, he was familiar with how the camera worked. As we crossed over Nevada County’s Scotts Flat Reservoir, Slater filmed wakeboarders while playing with the brilliant and responsive Canon zoom lens, which allowed for wide to telephoto perspectives. Within 30 minutes, he had found a pair of Bald Eagles and was able to track one in flight, while we banked to maintain a safe distance from mountain peaks. Judging by Slater’s sounds of delight, the Elite was exceeding his expectations. As I watched on the monitor, I could see clear sharp images with no sign of vibration — despite the camera being zoomed to its maximum telephoto setting of 300 millimeters. Regardless of the camera platform, pilots need to understand the lighting, camera angles and visual effects the director is looking for, in order to help capture his vision of the scene. Typically, communication logistics between the pilot, aerial camera crew, director, and ground assets become a real challenge, necessitating the coordination of actors, cameras, lights and special effects. 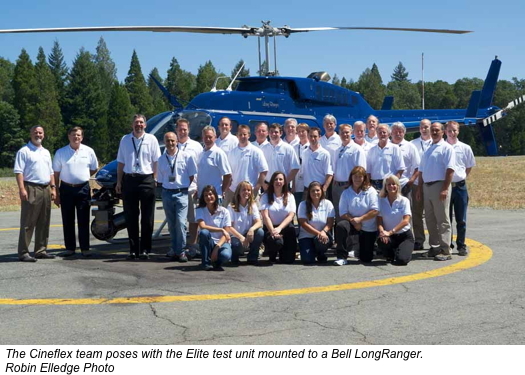 Prior to the Elite, flying with a true cinematic camera meant flying with a 300-400 pound, three-foot ball slung off the side or nose of a Bell 206 LongRanger or Eurocopter AS350 AStar. Pilots needed special training and practice to become familiar with the added weight, load distribution and impaired forward vision with nose mounts. Add a camera operator, an aerial director, 200 pounds of camera control and recording equipment — and possibly an assistant camera operator — to this off-center static load, and capacity is a real issue. Fortunately, the Elite camera system addresses many of the issues involved in a shoot, so the pilot can concentrate on what he or she is trained to do — fly the aircraft safely. The Elite does not require special training or experience with prior systems because of its relatively light 85-pound turret, which mounts to the underside of the nose without impairing the pilot’s vision. Additionally, video, cabling, mounts, and control equipment are compact and light, bringing the entire system in at less than 200 pounds. Because the Elite was designed for a bare minimum of operator support, just one camera operator is needed. Often this can be the aerial director, taking on the dual role of director and cameraman. 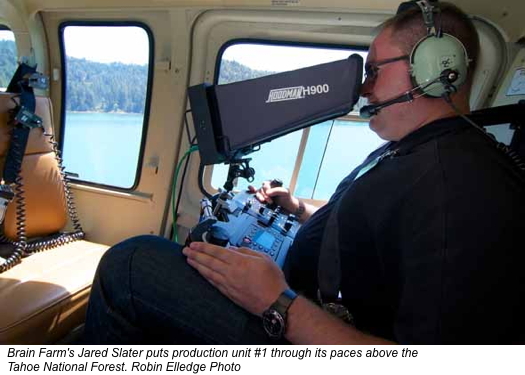 For operators, the Elite opens new opportunities for high-end film production because lighter-lift aircraft can be used. Pilots don’t need any special training or experience, and aircraft don’t require special mounting or electrical modifications. For filmmakers, the ability to use fewer crew and camera operators, lighter aircraft, lighter loads, and easy shipping all makes for a more cost-effective shoot, potentially saving thousands of dollars. 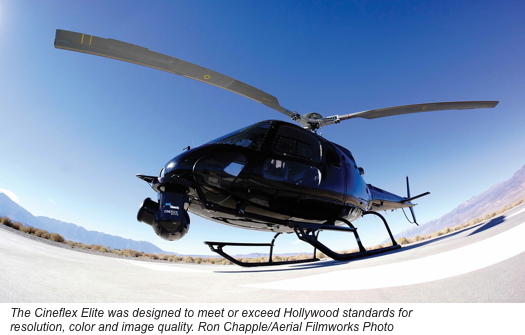 Chapple says the Elite is the future of aerial feature film shooting. From my standpoint, I can’t see a system being much easier to mount and operate — and it certainly beats having to fight the elements through an open helicopter door. For those of us who make a living in shooting those jaw-dropping aerial shots that blockbuster movies and ground-breaking nature documentaries rely on, the Elite just made life a whole lot easier. Robin Elledge has been a professional photographer and writer for over 25 years and attended Brooks Institute of Photography. He has done work for Anheuser-Busch, 20th Century Fox, Graphic Design Magazine, and the states of California and Wyoming.